A somewhat strange error message can occur at random on iOS, typically for iPhone users, that states “Unable to Download Item. Please try again later” with a “Done” and “Retry” button options. The thing that makes this error message strange is that it appears at random and not after the user has attempted to download or update anything to the iOS device. So what should you do if you get this error message on your iPhone or iPad at random, sometimes even repeatedly? That should be the end of the message, and you will likely never see it again. 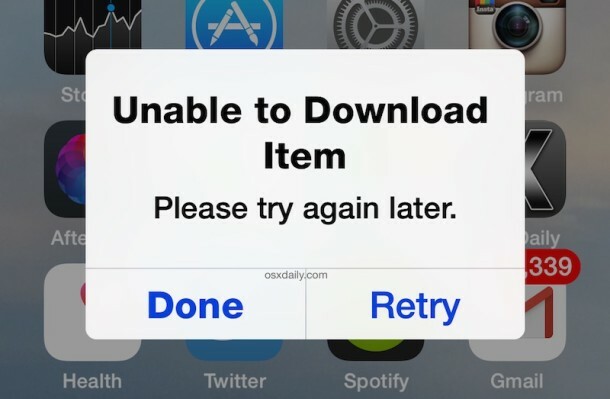 There are a variety of attempted explanations for the Unable to Download Item message in iOS, most of which have to do with iTunes Match, iBooks, or the iOS Automatic Updates feature which downloads apps, music, and media, but turning off that feature may still lead to the message appearing. Some users were also able to narrow the error message down to the weird U2 album thing, but again that’s not consistent. The only thing consistent about this error message is that it’s not particularly consistent, which perhaps indicates that it’s more of a bug than much else. If you’ve encountered this message for a legitimate reason, or out of the blue, and you discovered why it happened or a way to dismiss it that’s different from the Airplane mode trick above, do let us know in the comments! I had the issue for months on end and tried all of the reported things to fix it. None worked. I finally discovered that it was caused by the Overcast app that was trying to download some old podcasts that were no longer available online. When I deleted the incomplete downloads from Overcast the problem was (finally) gone. The general issue seems to be related to background downloads of apps, podcasts, music, etc. that fail, and are retried over and over. It seems that many different causes can lead to the same cryptic popup. It would be helpful if the dialog displayed which download failed in which app, so that the user could take the correct action to cancel the download. I had the same problem, came up all the time. I deleted Overcast and it went away after that. I was kept getting this same error message intermittently when connected to wifi over the past few months. After reading your comment I tried deleting all the podcasts in my podcast app (don’t know if it’s called overcast – it’s just the one that was already on my phone – the purple one) and I think it worked! I was in the middle of trying to do a iCloud backup but the error message was preventing the backup from completing and now it’s working. Thanks! I get this a lot on my Verizon Galaxy Note 3. Don’t know what causes it or how to stop it. I may try some of the suggestions. Your website is awesome. I can’t tell you how many little nagging issues you’ve helped me solve over the years. Anytime I ever see “osxdaily” returned in my google search to any question I might have… I always click on your links first… because you always have the right answer. A+ for consistently having such a solid site. I always click some of your ads just to offer some support. Have a great day. You sir are an internet hero! Thanks for the tips. I updated Vodaphone via the app (previously set to manual updates, which I hadn’t ever done), and (fingers crossed) it seems like a fix. I’m getting “unable to download app” when trying to download tinder. I can download any other free app. Why? Your girlfriend doesn’t want you downloading Tinder? I bought the NBA2k16 at Apple store but an error always appeared “Unable to download at this time” .. please help! I started having problems after the new year started and cannot download CNN or a voice recorder update and had deleted those after a dozen tries. But the Weather and iMessage updates I was able to download and I downloaded a solitaire game. I called Apple and they have no idea what is the problem or what do about it after talking to them for over an hour. I downloaded 9.2 software update and reset lots of things on my phone and still cannot download CNN or the voice recorder and update. So odd. Like others have mentioned, when the error shows, it takes over and locks the screen and I can’t get to the swipe or into settings to turn on airplane mode. Having same issue. It started for me after I switched internet providers. Set my new network up and viola there it is. I installed a new modem and new router after changing service providers. I’ve got about 6 iOS devices in my house plus other things on the network. What I found is that I’d reset the router, setup a new network and the error might not be on my phone but now my kids phone. I try again and his phone works but then another does not. So it’s totally due to the network from what I can tell and it jumps from device to device. I’m using an ASUS router. Baffled by this. Any ideas please share. Update. On the device with the issue I went into wifi settings and clicked renew lease. It may have fixed the issue. So far so good. I keep getting this message randomly and multiple times in a row even when I select “done”. It is more persistent since I updated to OS9. It makes me want to delete the update because the message is so frequent. There is nothing wrong with my available storage or my internet connection when I get this message. Having this problem, quite out of the blue, today. Have tried many options to no avail. I wonder if it’s an App Store issue? guys I have been playing Clash Royale since February, then just 4days before today my friend uninstall my game, now I want to download it again but then its been 3days I’ve receiving “Unable to download this app” .. guys help me pls, I tried changing providers but still not working, I tried SkyBroadband, Globe, and PLDT,. help me please. Same issue , unable to download try again !! iPhone 4 . Some videos play others don’t ! Now my songs are aching up . Choose one song and another random song plays !! Paid good money over the years , very disappointed !! I had the same problem for a few days now. Read through this thread and still couldn’t resolve it. Then I decided to just update whatever apps I had (16 updates as per the App Store). After a few updates, I tried downloading a brand new app…. And it just worked. So for me, it was just a matter of updating SOME of my existing apps then I could download new apps. Hope this works for you guys too. For me this message started popping up a few days ago. It’s very frustrating and I am unable to download any apps. And when I hold down the power and home button to reboot, my iPhone screen gets stuck on the apple logo and I have to connect to iTunes and go into recovery mode. Not sure how to fix it. Had this same ongoing issue trying to download the “Viber” app. Here’s what worked for me. I went to my general settings-wifi setting-reset network settings. Let the phone restart, then tried downloading the app again via cellular service BEFORE I reconnected to my wifi. It still took awhile but finally downloaded. It got hung up at about 3/4 of the way in…but never got the message again…probably took around 5-10 mins total to download, which is still weird, but whatever…atleast it worked this time. Hi. I am unable to download netflix. It says ‘ It can’t be downloaded at this time with a retry download and done option. ‘ I tried the flight mode thing but it still does not work. What should I do? Hey, I downloaded it using mobile date instead of wifi and it worked. I deleted the Music icon, touch and hold then press the x. Then I redownloaded the Music app from the App Store. Never saw the “error” message again. Problem solved. Try it, or something similar . I deleted the music icon and re downloaded the app and it worked. Thank you for the tip!! I just had the same problem with my iPhone 6 plus. In short, I shut my phone off, waited a minute then all was back to normal when I turned it back on. The only thing I was doing at the time was trying to text a pano photo from photos to someone without an iPhone. I wasn’t sure it was going to work (but I have sent them regular photos from the same app). I got the red explanation point saying not delivered and tried again. Then I tried changing, in settings, to send photos with lower quality, in hopes that would work; got same error. After that, I started getting the “UNABLE TO DOWNLOAD” error with retry or send… I tried to resend 1st and kept getting the error at same time my phone slowed down and my screen started freezing (no matter what app i was in at the time). I tried hitting the Done button thereafter. I changed my setting back to reg quality and deleted the pano texts I was trying to send. When continued to get the error I found this website, but I kept getting the error and screen freezes making it impossible for me to read the article. That’s when I rebooted my phone. You can’t do anything until you dismiss the message so this “solution” will never work. Hi Mark, the solution doesn’t work as described, you are correct, but if you make a small modification you can get there. When the error pops up, press your phones power button once to put the screen to sleep. Next be ready to move fast. With the phone screen dark, press the home button which will activate the screen and take you to the lock screen, use your thumb print to unlock your phone (on phones that support that feature otherwise enter your passcode, then quickly swipe up and tap the airplane mode button. If you move fast enough (probably have to do the home and swipe and tap within about a second), you can activate airplane mode before the error message becomes visible again. I hope that helps. I was having the same issues; Can’t share photo, try later…. My guess: Sharing from the camera roll doesn’t seem to work on older pics that may have been backed up to iCloud. But, it worked when, I shared the same photo from the iPhone photo app(not thru the camera). Maybe this is to save phone storage space? I had/have this problem with Music on my iPhone after downloading a Matt Monroe album. A message kept popping up saying ‘Unable to download song (On Days Like These)’ and then offered ‘Done’ or “Retry’ as my options. Pressing either did nothing to solve the issue. Strange this is that the song was downloaded. And the message persisted even after I deleted the song in question and the entire album. When this dreaded message pops up it is impossible to switch over to Setting on turn on flight mode. However, I have just hit ‘Done’ then switched flight mode on and off and all seems to be working fine again. Strange one. I think I’ll have to survive with Matt Monroe in my life. Thank you Richard for your post on April 11, 2017. It worked! I had been trying to send a photo for days. What I don’t understand is that it was only about two weeks old. I’d never had a problem sending older pics before so I’m going to have to find out more about what’s going on, but in the meantime I can send my photos out!